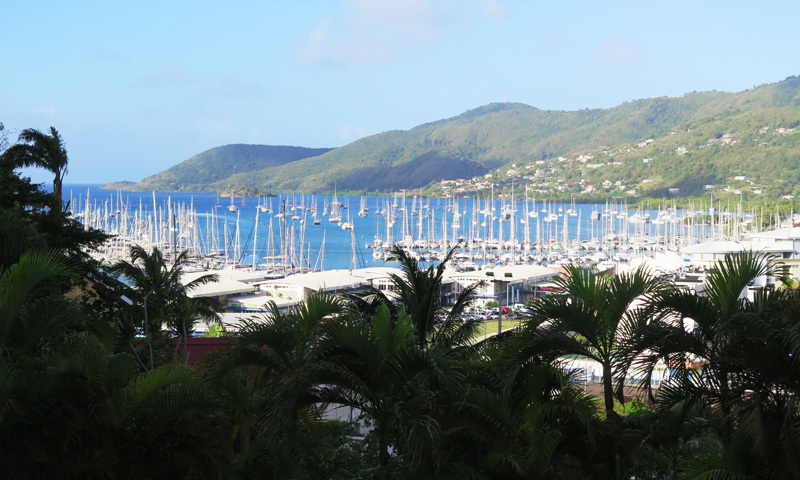 The boats Blue Wind and Lovesail arrived yesterday in Le Marin, so now the Blue Planet Odyssey and Pacific Odyssey fleet are now all assembled in Martinique and preparing to begin the grand adventure this Sunday. The sailors got acquainted over cocktails last night, appreciating the opportunity to finally meet in person the boats they will be sailing with. The Port du Marin Marina and the Office du Tourism du Marin have been preparing a program for the sailors that includes a farewell drink on Saturday evening after the Skipper’s Briefing. The fleet is quite fortunate to be starting this Sunday during Marin’s annual patron saint festival. Sunday’s festivities include a regatta in Le Marin of yoles, traditional Martinique sailing craft. The Blue Planet Odyssey sailors will be able to enjoy the colorful regatta as they set sail Sunday.